I had a unique experience this month, I quite literally went through all four seasons in the space of 3 1/2 weeks, although not in proper sequence. It went like this - Winter from March 1 to 2, Summer from March 3 to 20, Autumn from March 21 to 24, and Spring from March 25 to now. Not only that, but some of those summer days were more wintry than what typically passes for winter here. Needless to say I was traveling and my garden was getting by on its own. Other than my kitties and my own bed what I missed most sorely was fresh vegetables. Fresh veggies are always hard to come by when eating on the trail or in restaurants, but it seems that good fresh veggies are in general a rare commodity where I was visiting for most of the trip. I made a lot of mental tours through my garden imagining, hoping, craving what it might provide when I got home. The garden did not disappoint, all my hard work to get as much started as possible before I left home paid off. The garden was starting to produce even before I left. I cleaned out the snow pea plants and saved the tender tops and every pea I could find. Then I harvested all of one patch of arugula days before I left and left it for my friend who was staying for the duration of the trip. I immediately sowed another round of arugula in that spot in hopes of having more ready when I got home (nearly ready!). The spinach was starting to produce just before we left so I made one pass through the patch. We managed to eat that but I don't remember how I prepared it. One other harvest before we left was a head or two of celery. It was just starting to show the first signs of bolting but it was still delicious. I trimmed the tops down and quartered it lengthwise, then braised it in Turkey broth with a bit of bacon and then gratineed it. My husband loved it cooked that way and kept asking me during the trip if we could have that again when we got home. Sorry honey, but the celery has well and truly bolted now. Fast forward 3 1/2 weeks and let's see what the garden offered up in late March. Here's what I could salvage from the bolting celery. These are the shoots that developed inside the joints next to the individual stalks of the celery head. The stalks were getting hollow and cottony but the young almost flowering shoots were still crisp and tasty. I trimmed the leafy tops off of the shoots and then braised and gratineed them in a similar preparation as the previous heart of celery - it was better than I expected. The fennel patch needed to be thinned out so here's half of the baby fennel from the patch. These were trimmed and then quickly grilled on my stove top ridged griddle. One accidental harvest of Golden Chard which did not make it into the tally. The extra onion starts that I planted for spring onions are sizing up beautifully. These were grilled along with the baby fennel. Ah ha! I couldn't believe it, the first fava beans were ready to harvest. This may be the first time I've harvested favas in March, they usually aren't this mature until mid-April. These were added to the grill with the onions and fennel. I made a quick Romesco type sauce to accompany the grilled veggies with some preserved peppers from my stash in the refrigerator. The Early Rapini seedlings that I had set out not long before I departed for vacation grew like crazy and were/are trying to burst out of the protective micromesh tunnel. These were blanched first and then I used some in a simple sautee, some went into a frittata, and more went into a breakfast scramble. And this is only half of what was ready to harvest last week. Shortly before I left for vacation I had cut the spinach down to just a few baby leaves per plant and when I got home I found a spinach jungle. This is the harvest from one of the three rows in the garden. This basket looks deceptive, it weighed in at 2.8 pounds after I went through and trimmed off a pound of stems. One night I wilted about half of it with garlic and butter. Another night I simmered the rest in a tomato broth to be served with pan roasted halibut. And there was enough of the garlicky preparation left over to add to vegetable soup another night. I harvested quite a few of the spring onions last week. The ants got into the carrot patch and were farming aphids on the stems. They had really made a mess of things and the carrot tops were dying so I pulled all of them out. There were also a few parsnips (don't remember the variety) that managed to germinate and grow in the carrot patch so they came out also. Sugarsnax and Circus Circus mixed carrots. The last two overwintered celeriac were just starting to bolt so I pulled those out as well. They were still quite good and one of them went into a soup along with some carrots, Purgatory beans, onions, and Italian sausage, and the rest of that garlicky spinach. Mmmm, that was good Saturday night when it got cool and rainy. And finally, yesterday I harvested the first beautiful head of Kagraner Sommer butterhead lettuce. I was quite proud to present that as a gift to some friends who had us over for brunch yesterday. I also added the first harvest of Purple Mizuna (just starting to bolt), some baby fennel and a couple of spring onions to the goodie basket. Whew, I've been doing a lot of catching up in the last week and there's still a lot left to do. Here's the harvests from the last week of February and this past week. 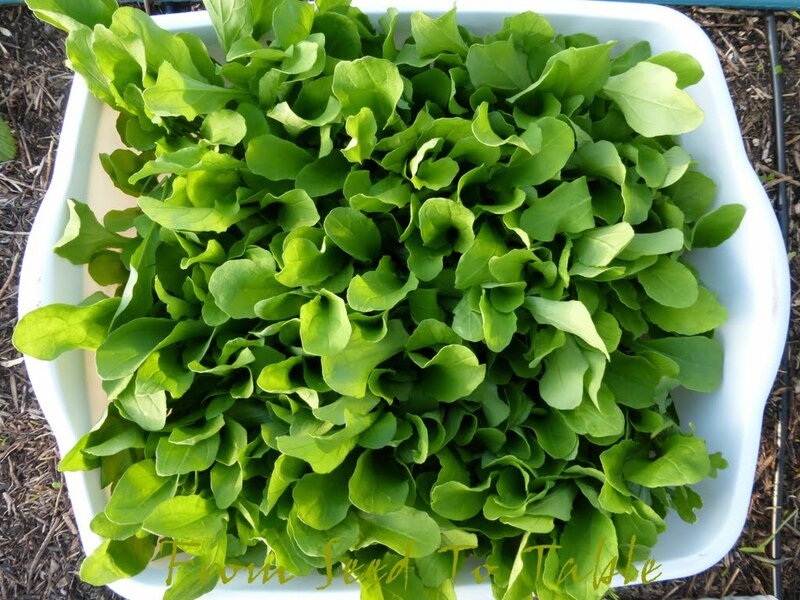 Tuscan Arugula - 1 lb., 2.4 oz. Circus Circus carrots - 1 lb., 12.7 oz. Sugarsnax carrots - 1 lb., 6.2 oz. 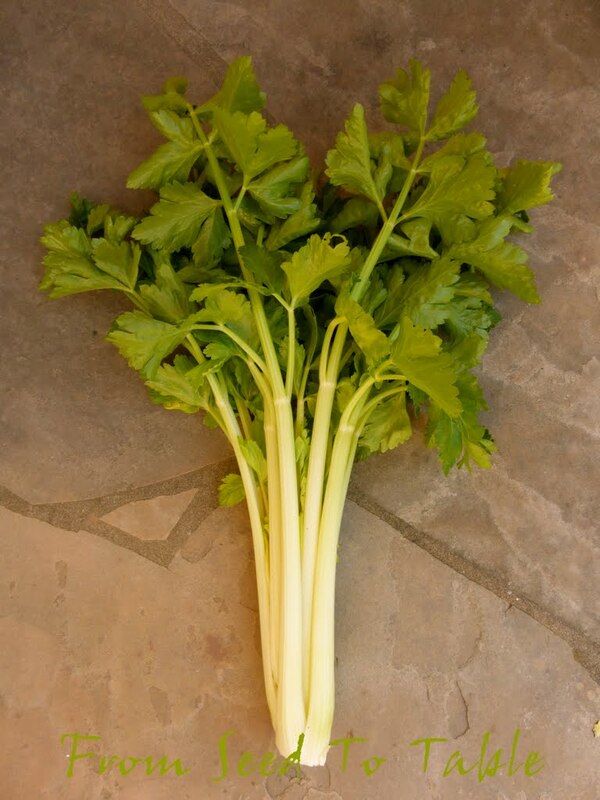 Dorato d'Asti celery - 3 lb., 10.6 oz. Monarch celeriac (celery root) - 2 lb., 5.5 oz. Extra Precoce Violetto fava beans (broad beans) - 15.9 oz. Kagraner Sommer butterhead lettuce - 1 lb., 1.6 oz. Romanesco fennel - 15.6 oz. Purple Mizuna - 3.3 oz. Mixed spring onions - 1 lb., 9.1 oz. Oregon Sugar Pod II snow peas- 10.7 oz. 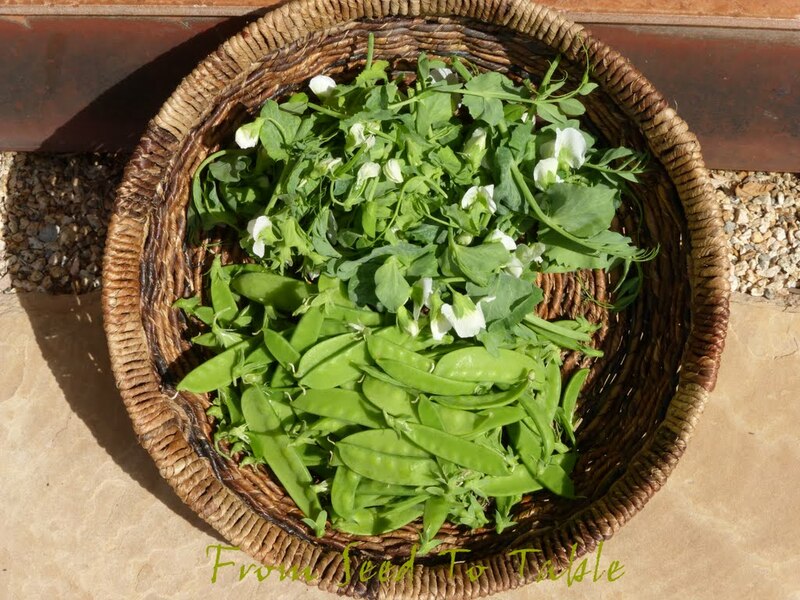 Snow Pea Shoots - 3.4 oz. Early Rapini (trimmed) - 2 lb., 8.7 oz. 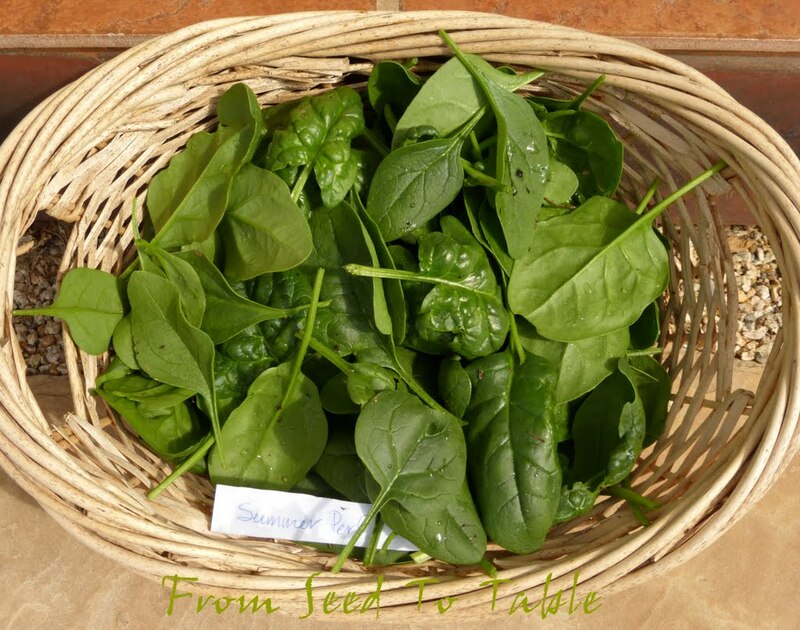 Monstreux d'Viroflay spinach (trimmed) - 7.8 oz. 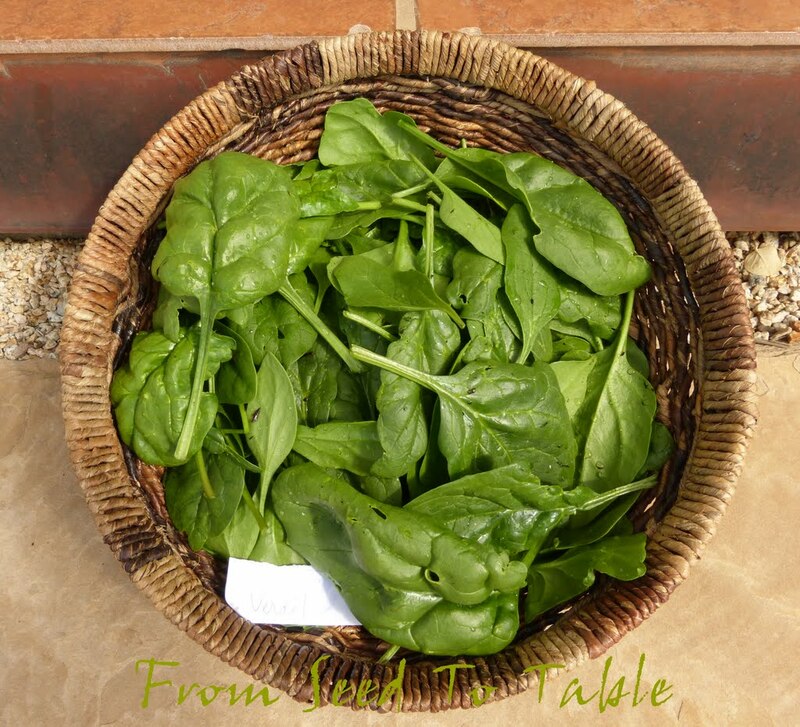 Summer Perfection spinach (trimmed) - 11.5 oz. 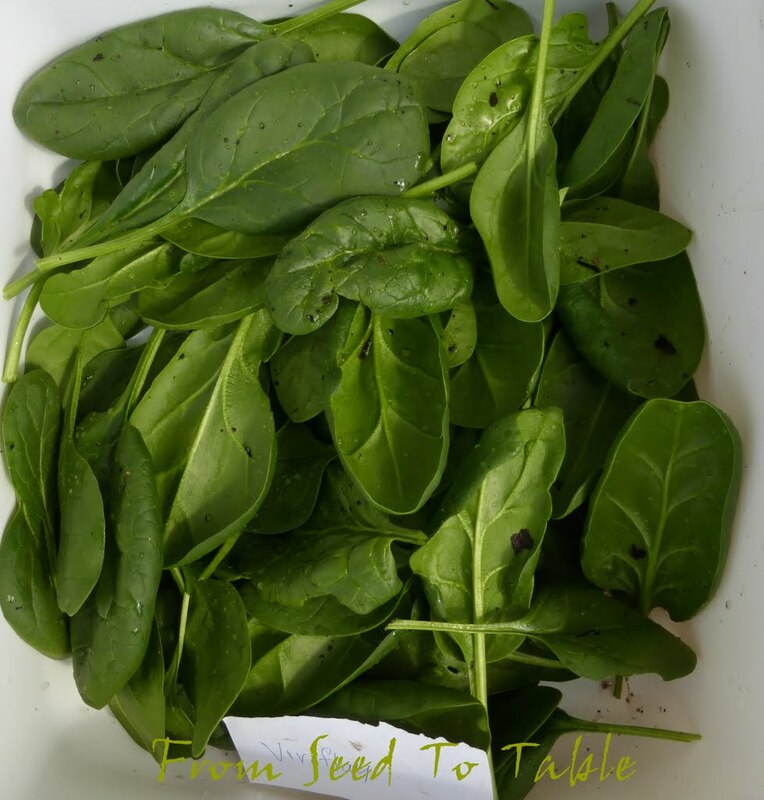 Verdil spinach (trimmed) - 3 lb., 8.9 oz. Stay tuned for the next garden tour post if you want to see how the garden fared in my absence. Here's a hint if you're curious about where I was off to for much of March.